We still don’t know much about the U.S. Air Force’s upcoming stealth bomber. But at least now, we know what the flying branch is officially calling it and what it might look like. On Feb. 26, Secretary of the Air Force Deborah Lee James showed an artist’s rendering of what the service is now calling the B-21 at the Air Force Association’s annual Air Warfare Symposium in Orlando, Florida. James said the plane doesn’t have an official nickname yet — like Stratofortress for the B-52 or Lancer for the B-1 — and she’s looking for suggestions from airmen. Otherwise, the Air Force chief offered few substantial details about the new plane, previously known as the Long Range Strike Bomber, or LRS-B. On Oct. 27, the flying branch picked Northrop Grumman over a team from Boeing and Lockheed to build as many as 100 of the high tech bombers. “The designation B-21 recognizes the LRS-B as the first bomber of the 21st century,” the Air Force explained in an official news item. Aviation experts have long referred to any potential new bomber as the “B-3,” following on from the current stealthy B-2. Then as now, the service’s top officials gave few specifics and declined to even offer an estimate of how much the new fleet would cost. Existing figures value the stealthy flying wings at $564 million each. The biggest reveal was that Northrop has yet to actually build any B-21 prototypes. Claiming in part that the Air Force hadn’t taken certain elements into account when estimating this price tag, Boeing and Lockheed were quick to challenge Northrop’s win. On Feb. 16, the Government Accountability Office formally denied the protest. With scant information available to the public, reporters and others could do little but speculate as to the real factors at play in the government watchdog’s final decision. 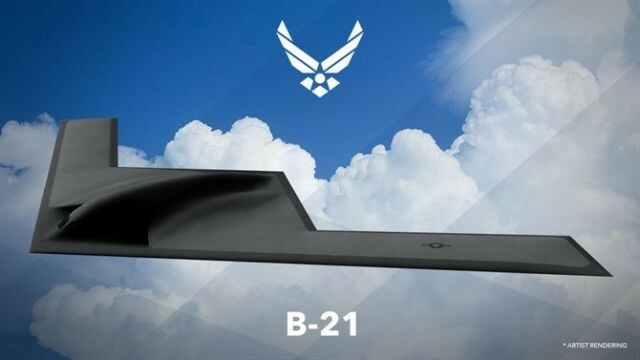 The new B-21 concept art — which looks very much like Northrop’s older B-2 — might offer some clues as to how the Virginia-headquartered defense contractor plans to build the planes at a lower than expected price. “The B-21 has been designed from the beginning based on a set of requirements that allows the use of existing and mature technology,” James noted when asked about the similarities between the B-21 and B-2. However, she declined to give any new specifics about the plane’s on-board computers and systems, engines, armament or stealth features. This lack of information may not help sway the bomber’s opponents in Congress. The Air Force has been under pressure to release more details to help push lawmakers to support the program. McCain was referring to a part of the deal that would put taxpayers on the hook for a certain extra amount on top of the initial costs. The government ostensibly uses these clauses to handle unforeseen issues that crop up during development. With the Air Force still struggling with the costs of the troublesome F-35 stealth fighter, legislators are not likely to be thrilled about the possibility of a new aircraft going over budget. And unless the Pentagon’s budget dramatically expands, the two expensive jets could end up competing for the same, limited pool of funds. The quest to build a new bomber is already almost a decade old. In 2006, the Pentagon proposed what became known as the “2018 Bomber.” This in turn became the Next Generation Bomber, before finally turning into the LRS-B. Barring any funding troubles or other delays, the Air Force hopes to get its first B-21s into service sometime in the mid-2020s. But first, Northrop must build a prototype.